Our museum is in the centre of the seaside village of Rosemarkie near Inverness, and entry is free! It is renowned for its display of Pictish carved stones. They were originally part of the vibrant early Christian monastic settlement here, around 1200 years ago. The artistic skills of the Picts inspire all age groups. The museum always has activities for children and families. 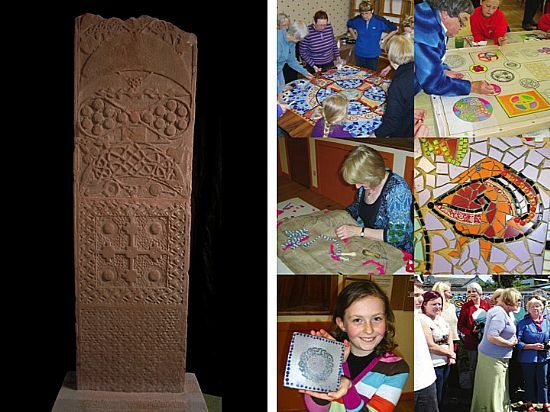 We also regularly hold arts and crafts events in the village, with outreach sessions across the Black Isle and beyond. One man was fascinated by Pictish interlace and key patterns - George Bain (1881-1968). He worked tirelessly to enthuse others to learn and develop their own designs. We care for his surviving artworks, a nationally significant Recognised Collection. Visit our Spring exhibition !